Free Cookbook Mr Food Cookbook! Easter is coming up and you may be wondering what to cook. Don’t rely on the same tried and true recipes- switch things up a bit with the free Mr Food Cookbook! Head over and sign up for the Mr Food Test Kitchen. You will receive free recipes, newsletters, and partner offers to go along with your free cookbook! 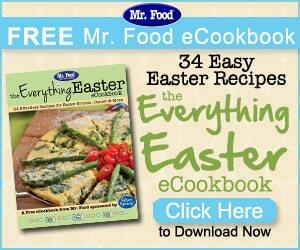 This Mr Food Cookbook has 34 great recipes for everything Easter! Get yours today!